Does David Cameron have to take off his shoes when he passes through a scanner? I don’t know; but the answer to that question, you’ll agree, rather depends on whether the Prime Minister has to pass through a scanner at all. the table would have draped a directory of 50 countries down the Row Label column. The reason for the discrepancy: the duplicative spellings United States/USA and United Arab Emirates/UAE. Excel doesn’t know any better, or course, and as such treated those four usages as four countries, an impermissibly misleading redundancy. In the interests of deep background, I brought these excesses to the attention of article author Ami Sedghi via a Tweet, and the repairs were made (I never received a reply from Ms. Sedghi for my citizen-journalistic contributions, though we could wonder if the Guardian had made the discoveries independently). 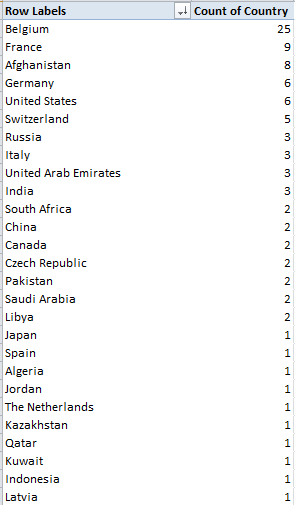 But even with all that vetting I still get 48 countries, and haven’t found any third instance of a same-country-entry inconsistency – not the biggest deal to be sure, but 48 isn’t 47. As the Guardian explains, the Belgian predominance has everything to do with European Union-seat Brussels, and Cameron’s recurring need to deal with and justify his coolness toward that organization to its other members. But the real fun happens over in the Date of Trip field, particularly if you’re keen to calculate trip durations. First note the this-way-and-that alignments of its entries, e.g. The scattershot left-rightness of the data isn’t borne of some random indecision; rather, it attests a pair of data types asserting themselves in the field’s cells. 20-21 May 2010 is clearly a label, for example, and in its present balky state thus resistant to any numeric services we might ask it to perform. The right-aligned 11-Mar-11, on the other hand, is just as clearly a date/number; click its cell and observe the Custom (as in custom date format) legend registered in the Number format field in the Home > Number button group for verification . Be that as it may, if I do want to get to those trip durations (even without thinking about whether to regard the very first pair of trips, the ones to Berlin and Paris and their identical dates, as one or two visits), I’d first want to insert three columns somewhere, these to be respectively titled Start Date, Finish Date, and Trip Duration, or something like that, the first two formatted in date terms, the third in numeric, no-decimal mode. I’ve chosen columns D through F for those remits. But we’re not having fun yet, are we? Ok; so let’s start with the actual date-formatted trip data (understanding as a first, or last, principle that any encompassing, formulaic workaround must be ultimately be IF-driven, so that all data-type contingencies could be enabled to yield a trip duration). By apparent definition these dates comprise one-day journeys – because a longer trip would have expressed themselves in label terms, e.g. 20-21 May 2010. Here we’re testing the entry in A29 for its numerical pretensions. If a number it is – that is, an authentic number formatted in date terms – the formula simply returns that date/number. If A29 is a non-number, then “” moves into the cell – although we need to understand that the double-quotes are nothing but a holding action, mounted in anticipation of a more substantive riposte to any label that might have laid its claim to A29 or any other cell in the data set. And unlike the Prime Minister, I’m working in economy class; and the guy in front of me is leaning back into my coffee, my laptop has 12 minutes worth of charge left, and we’re still only halfway over the Atlantic. And I still can’t figure out to play that bowling game onscreen.